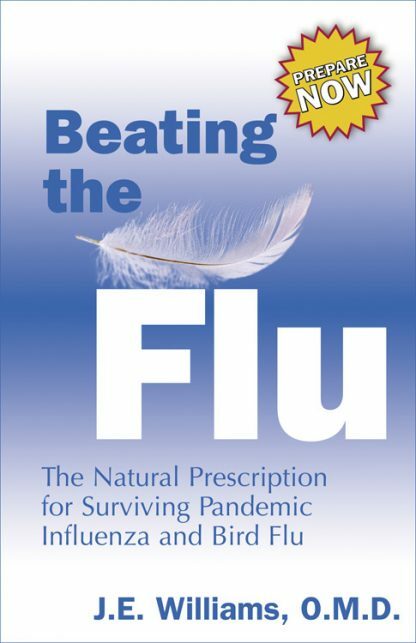 Red Wheel ∕ Weiser Online Bookstore | Beating the Flu: The Natural Prescription for Surviving Pandemic Influenza and Bird Flu by J.E. Williams, O.M.D. Every year, 36,000 Americans die of the flu and one million die worldwide. The possibility of a super flu pandemic is frightening. If no one has immunity, it could cover the globe in 250 days and conceivably infect 20 percent or more of the world's population of 6.6 billion. The 1918 Spanish flu killed 675,000 Americans and at least 50 million worldwide. The death toll from the bird flu virus--with a 50% kill rate in adults and a frightening 89% in children--could reach an apocalyptic 360 million. Worse yet, without a vaccine (or adequate supplies), and without enough antiviral drugs, modern medicine doesn't have a specific, effective, and safe treatment for the flu. This nightmare scenario may not happen, but if it does, it�s essential that individuals and families arm themselves with up-to-date information. Dr. J. E. Williams is an oriental and natural-medicine expert who has used herbs and vitamins to treat influenza and other viruses for more than two decades. In Beating the Flu, he begins not by telling you how to treat the flu bug, but how to avoid it altogether through a combination of good hygiene and super foods that offer the quick boosts your immune system needs to ward off the virus. Should you get sick, Dr. Williams also offers a "natural medicine cabinet� of vitamins, herbs, and minerals that work best against any kind of flu�along with the clinical evidence to back up the remedies. Dr. J. E. Williams has practiced Oriental Medicine for more than two decades and is the author of three books. Presently, he is the academic dean at the East West College of Natural Medicine.